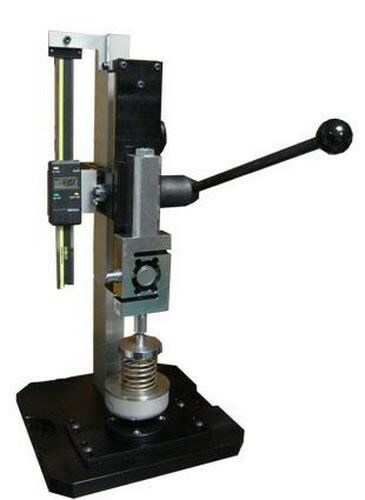 The TEX 555R test stand is ideal for low and medium force testing when a quick result and travel are required. This manual test stand makes accurate and repetitive tensile and compression tests for springs, crimps, foam, peel and crush applications. The TEX 555R test stand features a revolving hand crank, small footprint, durable design and portable. Combined with our Centor Force Gauges, the manual test stand TEX 555R can measure up to 2000N in production or laboratory for an affordable price. It’s available in vertical or horizontal orientations with table or wall mounting fixtures. Travel limits, digital ruler and auto-return spring are available in options.